I have always adored Cheltenham. With beautiful shops, restaurants galore and lovely, friendly people, I’ve been coming here for days out since as far back as I can remember, now we have found these delightful touring parks, we can come here more often and stay longer! We actually found Regents Park Stansby last year. The equally lovely Briarfields Hotel & Touring Caravan Park, round the corner and a few pounds more a night was full. As we have stayed in both, and they are literally only minutes apart, I would be doing my readers a disservice to review one without the other – they are both delightful sites I would be happy to recommend. 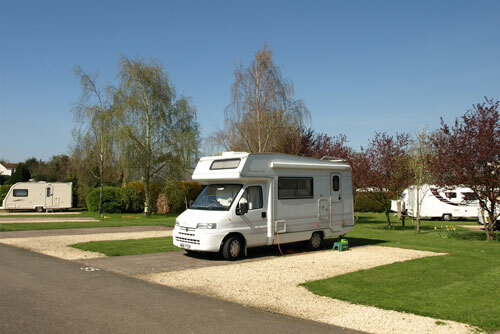 Both are very well run sites, with flat pitches, exceptionally maintained facilities and very friendly owners who can’t do enough for you. Both also have very good transport links, being 5 minutes from the M5 and both have handy bus stops close by. The attraction of both these sites is their generous pitches and the fact they don’t charge a surplus for very large tents. Those of us who follow our page will know that we regard our Glenwood as ‘the small tent’. Large tent owners take note, many of the other sites in the area struggle to take large old tents like our Kura and Diablo tents, and therefore charge a double pitch fee. This was initially what brought us here – although the Glenwood fits just about anywhere. Both sites are medium sized with plenty of generous pitches, but they don’t feel crowded. 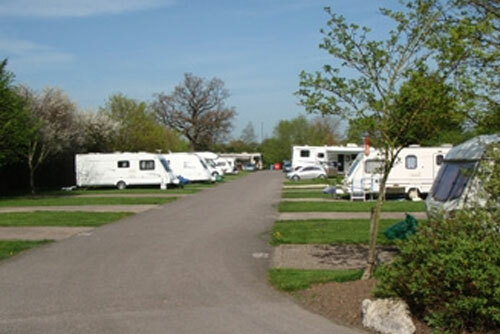 These sites have a very calm, sedate atmosphere and match the upmarket feel of Cheltenham itself, with well cut grass and an orderly, well kept approach to pitches. Both are about 5 minutes drive from a retail park with ASDA, B&Q, Home Bargains etc. and there is a KFC and Harvester restaurant nearby. GCHQ and Cheltenham racecourse are both close, as is the Nuffield private hospital. The town centre is ten minutes drive – and it’s one of my favourite places in England, so if asking what I recommend, it’s everything! 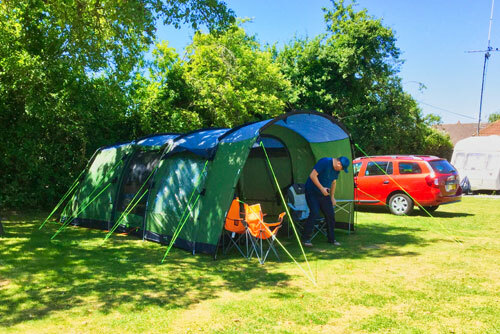 Briarfields is an adult-only campsite, with a motel in the grounds, so perfect for staying with family or friends who ‘don’t like camping’ but want to stay close to you. Briarfields has the best ladies toilets I have ever seen on any campsite, anywhere, with individual washrooms as well as showers and plenty of WC cubicles. I’d recommend other campsite owners wanting inspiration take a visit there! This site has hardstandings around the edge, with a lawned camping area in the middle, however the camping area is one of the flattest we’ve ever pitched on. The site was close to full when we went there, but pitches are spread sufficiently for it to feel comfortable. We thoroughly enjoyed our stay there, although our massive Vango Kura was the talk of the field…. one fellow camper asked if he could come and have a look at our ‘dance hall’ tent! This site is within an easy walk of the Harvester and KFC, and the handy bus stop just outside makes leaving the car on site a good option for enjoying the plentiful bars in Cheltenham. They accommodated us at very short notice at 6pm after another site we booked further up the M5 turned out to be a HUGE mistake and we wound up having a fantastic weekend here instead – such a lucky find! It remains one of the top 10 sites we’ve ever stayed at. Apologies, images from Briarfields website as I can’t find last year’s photos! Regents Park Stansby has such a similar feel to Briarfields that you could be forgiven for thinking they are owned by the same people – they aren’t, but again, this a site run to a really high standard. We don’t tend to separate the two, if one is busy, we just book the other – so they share their ranking in our ‘top ten sites of all time’. This site is set in a slightly more residential area, with a few residential mobile homes set to the right of the entrance. The bus stop is about 2 minutes walk up the road, so very convenient. Again, pitches are generous and the site feels very spacious, will well cut grass, extremely well decorated bathroom facilities and an on site shop that sells penny sweets – landed!! The on-site warden Diane is very friendly and the place is really well run. Given the residential setting, this site is great if you want an early night, the kind of place I would come to stay if I had a meeting early next day and wanted to bring my tent rather than stay in a hotel. Other campers and caravan owners here are respectful and quiet, in fact we joked that the place had an eerie glow around 9pm as all the caravan owners had their lights off and TVs on! Even the children and dogs here were a delight, the kids would play quietly by their tents, all dogs were on leads and the site has a real sense of calm. The weather last weekend was absolutely boiling and we were especially grateful to be given a shady pitch under a tree. It was much cooler than being at home and we wish we could have stayed longer and worked from the tent, given the extremely hot weather we’ve experienced this year. 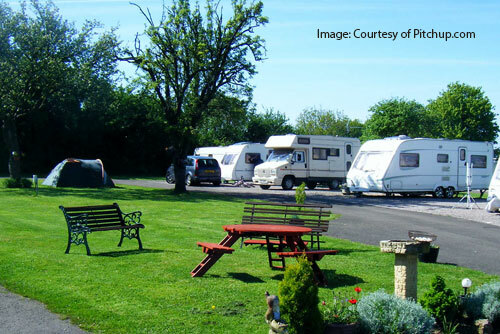 It has to be said that if singsongs til the early hours round a camp fire are your thing, or if you want big modern play areas with swimming pools and on-site entertainment, these sites are probably not for you – luckily for us, these sites are exactly what we look for, quiet, calm places to get away from the hustle and bustle of daily life, sedate in style and close enough to enjoy fine dining, quiet strolls and great shopping that the area offers! There is so much to recommend Cheltenham as a place, whether you like races, eating out, farm parks, architecture, shopping, history – the place has it all and these sites are very well located. Travelling further afield is easy, thanks to being about 5 minutes drive from the M5. If you stay here, ten minutes away is the Jet Age Museum. As I’m a volunteer they’d be disappointed if I didn’t give them a mention – it’s a really interesting place to visit. The aircraft and cockpit tours are fantastic, but what grabbed me were the lovely stories from other volunteers, who’d visited and found engines they had lovingly built years ago, and even aeroplanes they had flown in their youth! If you do take time to visit, take time to speak to them, this is such a unique museum and as volunteers, they are ‘living exhibits’ with their own story to tell. Visits are completely free (although donations are always appreciated, as the Museum receives no Government funding) and the Museum keeps Gloucestershire’s rich contribution to the Aircraft Industry alive. Of course, now I am a volunteer I have one more reason to stay at these lovely sites – we’ll be back.